Fortnite’s newest limited-time mode, Getaway, feels a bit like a mini-crash course in everything you need to know if you want to win in the main battle royale. The capture the flag-esque mode is full of dangerous drops and surprising turns of fortune. Matches are short but packed with new surprises. If you wanted something faster-paced than the main game, this is the mode for you. 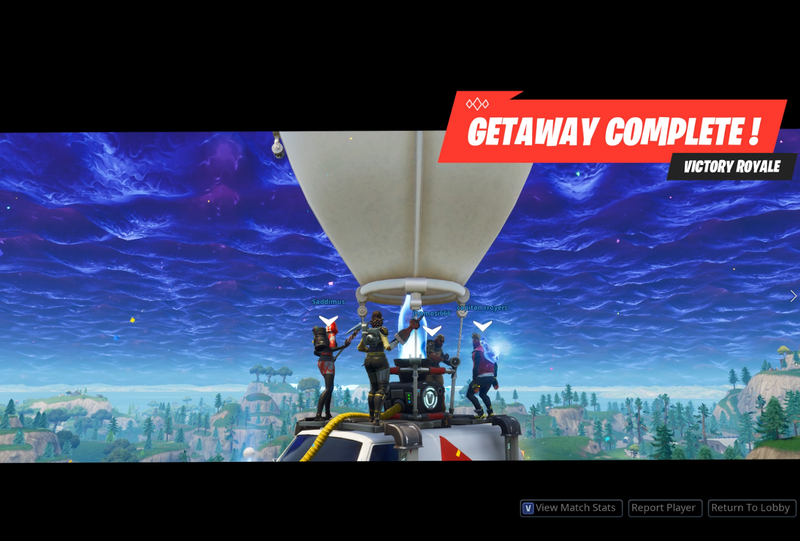 In Getaway, teams of four compete to capture four different crystal llamas and reach a getaway car with their loot. The action ends up split between these four trinkets, with massive battles that peel off into intense foot chases. Normal battle royale matches can feel reserved, and the mid-game tends to focus on leapfrogging from position to position while building up strong defences. Getaway cuts out that middle part. It’s all action, all the time. You drop, you grab the loot, you run and shoot, and if you’re lucky, you escape. There’s no real point to finding a remote location and working your way to victory. Instead, you pick one of four locations where the loot spawns and immediately start battling to claim it. If you get it, it’s time to start running to the extraction point. If not, it’s time to give chase. Getaway really challenged me to step up my game during gunfights. When you have three teams gunning at you, you learn how to toss up defences and focus your fire. It was a good excuse to flex muscles that I sometimes struggle with in Fortnite. I’m usually about positioning and movement, but because that hardly matters here, I engaged with the game in a much more aggressive and exciting way. Getaway doesn’t have the same building sense of tension as a normal battle royale match, removing some of the close calls that make getting a victory royale so intoxicating. Instead, the fast pace leads to a sort of Benny Hill chase scene where the smallest mistake balloons outwards. In my first victory, my team dropped farther away from the loot and gathered up weapons. We frantically chased down the team attempting their getaway, ending up in Loot Lake. They built a walkway to reach their escape car, which we knocked out from underneath them. They died and we grabbed the loot, only for a similar process to repeat. We built upwards as fast as we could, narrowly escaping before our own walkway was destroyed. It was sloppy and messy, and honestly wonderful. Methodical killers used to tense battle royale showdowns might find Getaway too hectic for their taste. But if you’re looking for an excuse to pick up the pace or challenge your combat instincts, it’s worth bringing this mode into your rotation. You’ll have your fair share of close calls and pick up some useful skills too.